Wounded Times: University of North Texas Veteran Kicked Off Campus After Service Dog's Bad Behavior? University of North Texas Veteran Kicked Off Campus After Service Dog's Bad Behavior? A veteran and student at the University of North Texas is worried about whether he will be able to continue his education there after his service dog was kicked off campus, KTVT-TV (Channel 11) reported. Tawan Throngkumpola, who served in the Navy for 12 years and survived three IED blasts and three traumatic brain injuries, is pursuing a psychology degree at UNT, the station reported. His service dog stays by his side, reminding him to take his anti-seizure medication and keeping him calm. 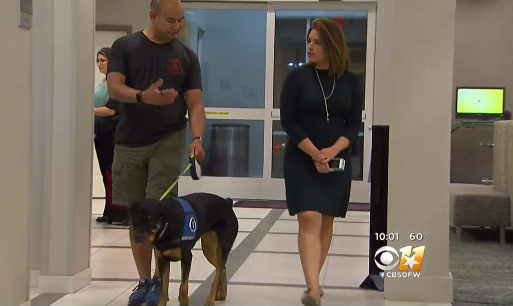 Recently, Throngkumpola told KTVT the university sent a letter saying his service dog is no longer welcome on campus or in his dorm because she is "a direct threat to the campus community." The university cited several complaints including that the dog barked, lunged at students and staff and bit the Office of Disability Accommodation director on his hand and heels. Two professors also said the dog startled students and disrupted classes.